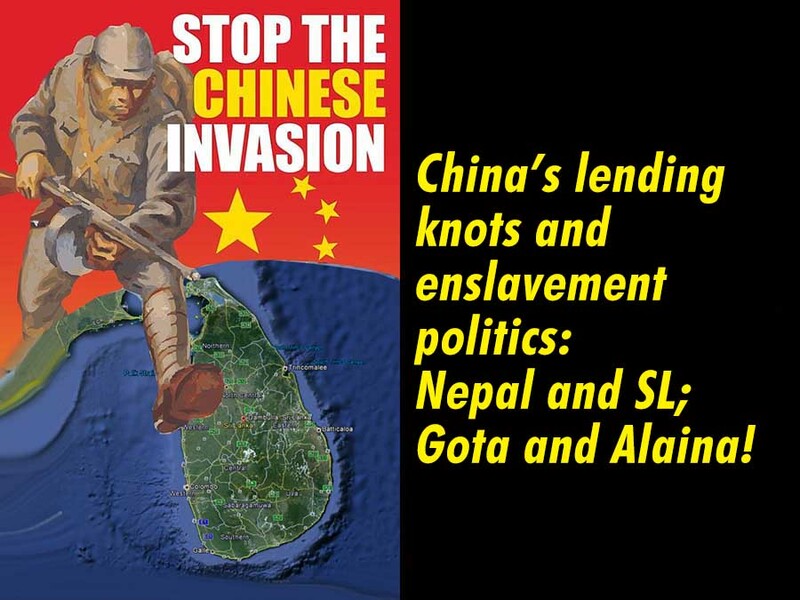 LEN - www.lankaenews.com | China’s lending knots and enslavement politics: Nepal and SL; Gota and Alaina! (Lanka e News -26.June.2018, 6.00AM) When an individual is unable to make ends meet – that is, unable to cut the coat according to the cloth or his income match the expenditure ,the latest fad is borrowing. It is a well known fact , a number of conditions have to be satisfied if a loan is to be taken from a bank. However on high interest terms , a loan can be taken from a village usurer (loan shark) easily at prohibitive interest rates-the borrower can keep a deed or even ear rings as a guarantee and obtain a huge loan most swiftly..
Why take a loan ? How is it going to be repaid? don’t concern the borrower at that moment . Many usurers of course are happy when loan payments are defaulted .This is because when the loan is unpaid ,the lender can get ownership of the property , land etc . including the borrower’s wife . There are countless defaulters who have fallen into the traps of usurers among us. There are many megalomaniac ‘show offs’ too among us who have fallen prey to leasing Companies after making a hash of their lease contracts. Let us warn it is however impossible for those who indulge in fake ostentation to escape the mockery they will have to face of the people . There are many countries in the geopolitical arena who have gone bankrupt by borrowing on prohibitive interest. Today , in that list of countries ,Sri Lanka is at the top. China figures prominently in the theme of conversation of everybody when it is about ruthless loan sharks , the country which lends at very high 8 % rate of interest. It is to be noted while China lends at prohibitive interest rates , there are countries in the world which lend at concessionary interest rates of 1 to 3%. Word Bank, Asian Development Bank and Japan’s cooperative agency are among them. If loans are to be taken from these Institutions , feasibility report, capability report and environmental report have to be forwarded in regard to the project in view. If the cost of the project , the benefits to be derived there-from and the environmental impact are satisfactory the loan is granted. Besides there are no intermediaries for these loans , and are directly granted to the government . Since the benefits of the projects are reaped after a long time , it is paramount these loans are obtained on a long term and at a small interest rate. Firstly , a feasibility study is done when a massive project is being launched. That is to identify the national needs and plans, and to ascertain whether the aims and objectives can be accomplished through the project. If it is perceived the objective of the project can be attained , then a capability study is carried out to determine whether everything is in order for the project to be successfully completed. One example of a project that was successful on these lines was the accelerated Mahaweli project. Following the farmer community that multiplied as a result of the Mahaweli project , the country became self sufficient in rice. The hydro power augmented the National power grid. Along the border of North and East , the Sinhala farmer community flourished while populating those regions. It was possible for the government too to re pay the loan taken on account of the accelerated Mahaweli project at 2 % interest over a period of 12 years. As the last government was tapering to an end , the notorious Rajapakses brought forward a number of development projects. Their sole and whole objective was to plunder the country wholesale under the pretext of development projects. Believe it or not , because the personal agendas of Rajapakses were masquerading as national interests none of the projects launched by the Rajapakses were supported by the most essential feasibility report or the capability report . Ports , Airport, Cricket ground, conference hall, cinema villages , administrative buildings and parks. In the end only the pockets of Rajapakses were lined with the huge illicit commissions while none of these projects brought in a revenue for the country .The people gained nothing from those by way of service. Consequently , the country fell into deep despair , being unable to repay even the installments out of the national revenue. Owing to the selfish agendas and rackets of Rajapakses whose gaze were fixed only on earning illicit commissions , the country was driven into a dire and dismal situation . By analogy , the country has been driven into dire straits in much the same way as the owner of a house losing the title of the deed of the house after borrowing at high rates of interest. So called Patriotism which spills over like the cesspit …. Though criticisms are mounted against Ranil , he is never an inefficient administrator. In 2001 when Ranil took over, the treasury was empty and the economy was in tatters. Yet within three years Ranil could resuscitate the economy by whatever means. In 2015 , Ranil had to take over a country which was drowned in debts on a scale unprecedented in country’s history; a country that was mortgaged to China by Rajapakse family reign; a country turned turtle because of the Chinese loans taken. It is very unfortunate the common man has not understood the destruction that was wrought on the country by the huge illicit commissions which went into the pockets of crooked Rajapakses a byword for corruption . Neither has he tried to understand the cause of this devastation . Although the Sri Lankans are only idly watching and are silent , the whole world is fully aware of the disaster the country has been plunged into and the most portentous signals of doom and gloom in store for the country. The evil fallout of all these debacles is , we are today made the slaves of China. While talking about patriotism from the cesspit of corruption and indulging in hate mongering against the West , our country had been driven into abysmal despair. Today the whole world is therefore frowning on us. We are looked down derisively , insolently and as worthy only of ridicule. The rulers , media and social activists are dumb before the Chinese Yuan . Because of the loan entanglement and enslavement ,our ‘first citizen ‘ is also dumbfounded and blind. The other reason is , the deep seated hatred against the West and the affinity for the Chinese. For instance , if the Hambantota Port and 15000 acres of the land around had been leased out to India or America , the locals who are prejudiced against India and America would have definitely been up in arms over it. The side not looked into in the protests against India and the West…. It is an incontrovertible fact that it is the unsavory reflections of the colonial rule which created this animosity towards the West and the affinity for China. However the hostility towards the West and India are not just because of the colonial era. That is the consequence of a Chinese plan. The geopolitics of China is planned not just for a few years but targeting several decades forward. For example , one stretch of the silk route project is planned to go on until 2050. The Chinese magazines in 1960’s and 1970’s were spread even among nooks and corners of the country. The Chinese magazines which were printed under the patronage of the Chinese Embassy in Colombo could be obtained at low prices and these magazines were given free to libraries. The Chinese magazines made a special contribution towards sowing the seeds fomenting anti West and anti Indian sentiments. The JVP founder Rohana Wijeweera himself in the statement made to the police in 1971 , clearly mentioned, it is China that sowed the concept of “Indian hegemony ’ which was one of his five famous classes . Moreover Wijeweera confessed it was China’s ‘creation’ . It is well to recall it were Wijeweera and the JVP that separated the umbilical cord of many politicians who are clamoring on political platforms today. Chinese loan knotted politics… . There are over 25 countries across the world which are today entangled in the loan knots of China , and sadly SL is the leading country in that list. There is no one who does not know about the Greek war Trojan horse heroism . From the time of the Trojan war , the Piraeus Port of Greece has been a strategic port. But now China has taken over that Port .China has also taken over the Australian Darwin Port on a 99 year lease. America, Italy , France and Japan have established camps which are in existence over many years in the Djibouti Port that is located in the nerve center of the Red sea . But now ,China challenging America has acquired 25 % of the ownership of Djibouti Port and 70 % container terminals. Pakistan which is a neighboring country of China is also strangulated by the loans taken from the former. Through the Panama papers it came to light how the Pakistan prime minister robbed via the Chinese projects. These robberies are not confined only to Nawaz Sheriff of Pakistan or the Rajapakses of SL , this is a common crime characterizing all countries which deal with China. It is the practice of China to generously reciprocate the rulers and officers who most dishonorably and deceitfully ‘sell’ their countries. Rising tide against China’s loan entanglement knots.. The first country that rose against China’s geopolitical lending enslavement was Nepal. The latter which was to build the proposed ‘Buddhi Gandhaki’ hydro power scheme at over twice the cost of SL’s Hambantota project , as well as several other projects were called off by the Nepal government which rejected the Chinese loan. The rejection of the Chinese loan which began with Nepal had today become a growing tide . Malaysia, Pakistan , Kenya and many other countries are taking measures to invalidate agreements with China. It was the then US ambassador Alaina Templits to Nepal who awoke and alerted Nepal to set the wheel in motion against China’s geopolitical lending enslavement. She launched workshops to create an awareness among politicians and civil societies , and to enlighten them on the Chinese loan entanglements and knots . Her activities did not stop at speeches and workshops alone. She wrote to the Nepal’s leading newspapers about China’s lending and enslaving politics which was disguised as aid. Her bold measures were something which would should shock all but that was the truth. Unbelievably she wrote to the leading newspapers in her own name !